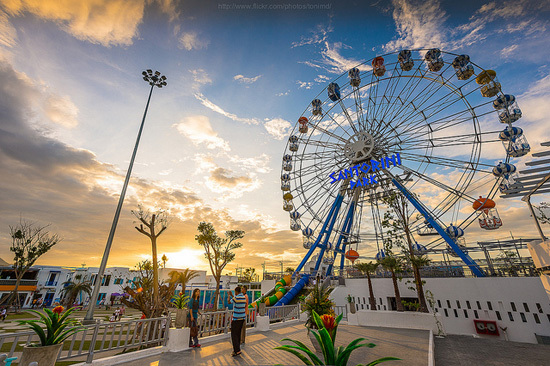 This is many people’s favorite day trip from Bangkok to Hua Hin. 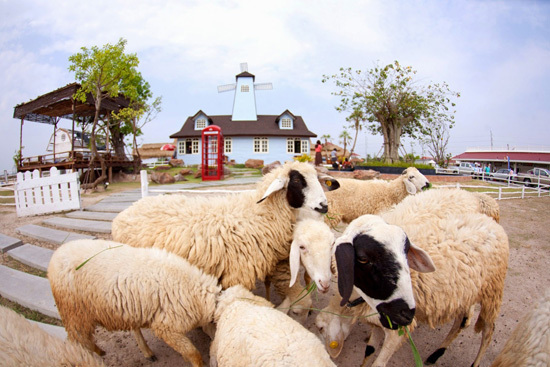 The Swiss Sheep Farm and Santorini Park are popular attractions for shopping and photo taking. Iconic landmarks in Hua Hin such as the Railway Station are also covered. 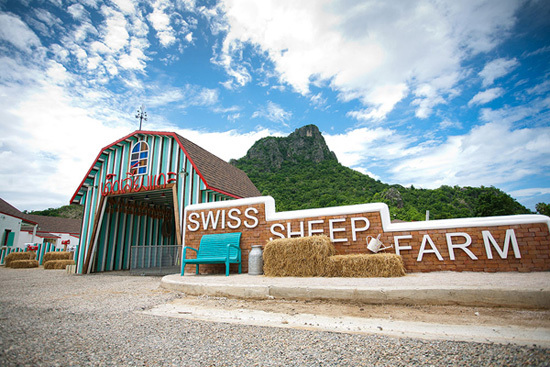 Hua Hin Swiss Sheep Farm is nice place for fun with the sheep and other animals. It’s a farm set near a mountain foot in European country style. Have fun feeding milk and grass to the sheep. Lots of photography opportunities with the friendly farm animals. Plenty of food and drink, homemade daily product and ice creams. A fun day out all round for everyone. Santorini Park is the unique complex in the style of the beach of Perissa in Santorini, Greece. It’s a popular place with lots shops for shopping and eating. Apart from the shops, there are 3D museum and 4D theater in the park and it is also a good place for taking photos as it is all in Greek style. The Trick Art Museum is a must for the whole family. The Haunted House there is quite scary. And if spending a few hours here is not enough, across the car park is the Santorini Water Park so it’s easy to spend a day here. 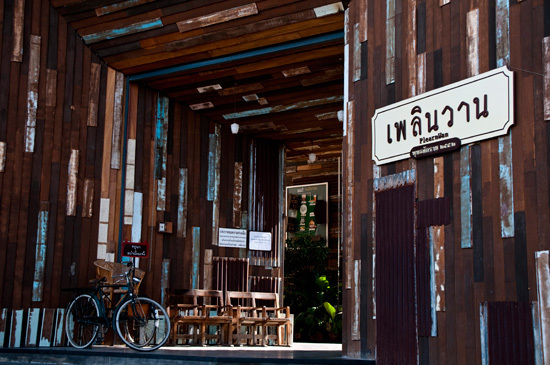 Plearn Wan is a vintage market filled with things of the past like old songs, old stuffs, old desserts, old-style advertisement posters, and bygone era temple fairs. Shops and booths operate inside wooden two-story houses. The shops on ground level mostly offer clothes and fashion and the ones on 2nd floor mainly cater food and beverages. There are plenty of local dishes, along with local snacks/dessert. They also have a cute antique motel inside. 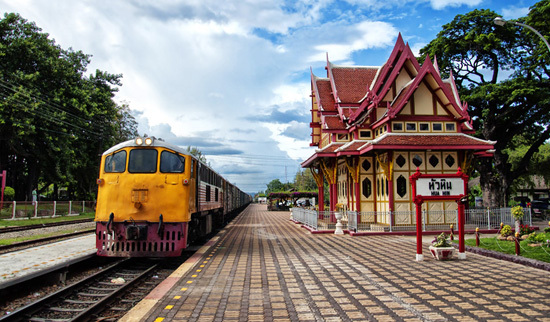 Hua Hin Railway Station is one of the country’s most beautiful train stations marked by its fine architectural details. Built in the reign of King Rama VI, the station features a Royal Waiting Room. The room was relocated from Sanam Chan Palace in Nakhon Pathom province during the reign of King Rama VI. This iconic landmark sits on a nice landscape in the center of Hua Hin and it will let you have a glimpse of Hua Hin connection with the Thai royals. Last but not least the trip won’t be complete without a visit to the beach. 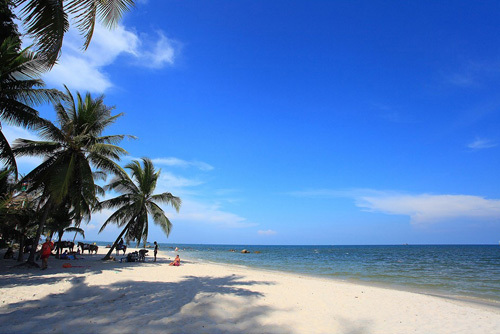 We can take you to Hua Hin beach where there will be more activities and people or quieter Suan Son beach. You can take a while to enjoy the sea, sand, sun, taking photos, and relax all round. Then head back to Bangkok after a happy Hua Hin day trip.